The Lumia 920 will be required to be rationed soon if Nokia can't produce enough to meet demand. We've seen retailers and carriers run out of initial stock. Whether this is down to high demand, limited stock or both, we're not sure but the Lumia 920 is proving to be a popular choice if the Exspansys UK Top 20 chart is anything to go by. 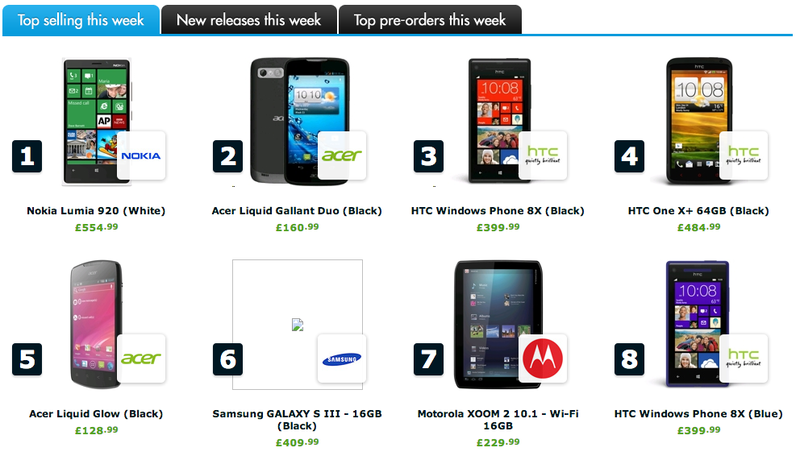 The Lumia 920 in white is at the top of the best selling chart (at a ridiculously cheap price of only £555) and is completely sold out - stock is expected in four days time. We're not finished with Windows Phones in this week's Expansys chart as the HTC 8X (black) is in third position behind the Acer Liquid Gallant Duo Android handset. HTC also has another 8X variant (blue) in the top 8, which also shows some demand for the Taiwanese Windows Phone 8 handset. Now, the Expansys top selling chart is nothing to go by officially, but it does provide a useful insight into what consumers are purchasing from the popular mobile retailer. Quickly checking the USA website, the HTC 8X (in blue) is in second position in the top selling chart behind a feature phone. Competing UK retailer Clove is also struggling to build enough resources to supply demand (more Lumia 920s are reportedly on their way), while Telstra took to Twitter to announce their excitement at the level of demand displayed by customers. Be sure to check out our in-depth review of the Lumia 920, as well as the follow up holistic analysis, for an overlook at what's included in the Nokia Windows Phone that makes it stand out from the crowd. Have you placed an order for the popular Lumia 920? Source: Expansys; thanks, Mike, for the heads up!